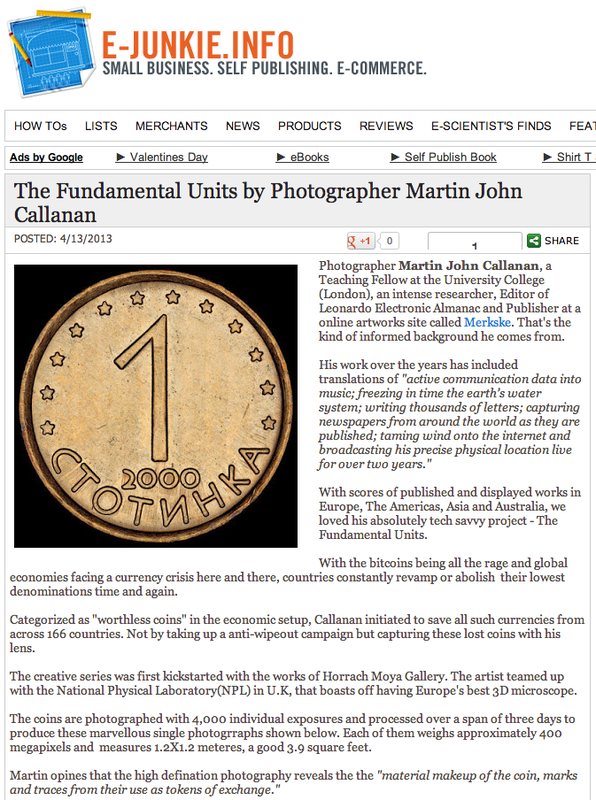 Photographer Martin John Callanan, a Teaching Fellow at the University College (London), an intense researcher, Editor of Leonardo Electronic Almanac and Publisher at a online artworks site called Merkske. That’s the kind of informed background he comes from. With scores of published and displayed works in Europe, The Americas, Asia and Australia, we loved his absolutely tech savvy project – The Fundamental Units. With the bitcoins being all the rage and global economies facing a currency crisis here and there, countries constantly revamp or abolish their lowest denominations time and again. Categorized as “worthless coins” in the economic setup, Callanan initiated to save all such currencies from across 166 countries. Not by taking up a anti-wipeout campaign but capturing these lost coins with his lens. The creative series was first kickstarted with the works of Horrach Moya Gallery. The artist teamed up with the National Physical Laboratory(NPL) in U.K, that boasts off having Europe’s best 3D microscope. The coins are photographed with 4,000 individual exposures and processed over a span of three days to produce these marvellous single photogrraphs shown below. Each of them weighs approximately 400 megapixels and measures 1.2X1.2 meteres, a good 3.9 square feet. An interesting tidbit about currencies before you can check out these beautiful reproduction of coins from Australia, Chile, The Euro, Mynamar, Kingdom Of Swaziland. Every coin the US State Treasury mints to produce 1 cent coin costs them 2 cents. Its best to undesratnd the value of the metal and the human resources that go into producing a small denomination of the currency. With people dealing everyday in millions and billions, probably the value of a cent goes unrecognized. Do have a look at Martin’s samples below.